Whether you are a visitor, a new resident, or just want to know what's going on in your town, we hope these pages will provide the answers to your questions. Check the Chamber of Commerce's community-wide calendar for upcoming events by clicking on above button. Note: You may add events for your club or organization by contacting the Anson County Chamber at 704-694-4181 or emailing the Chamber at AnsonChamber@windstream.net. 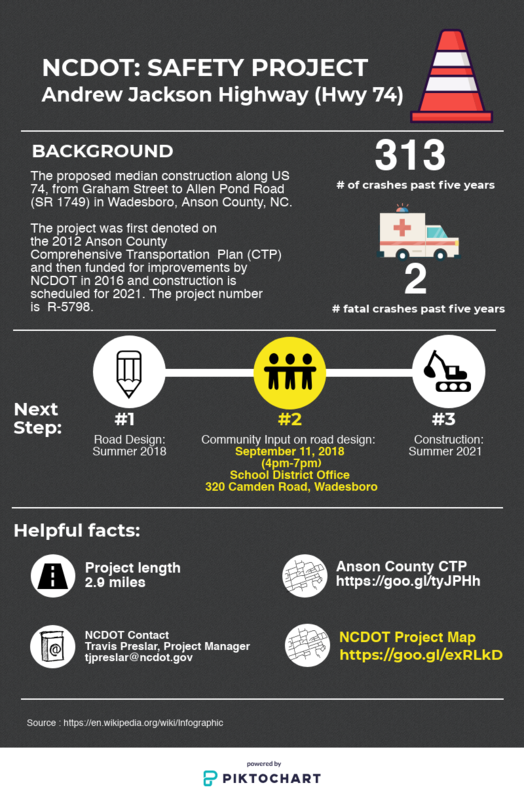 ​• The NCDOT is hosting a public meeting on September 11, 2018 at 4:00 pm at the Anson County Schools' Administrative offices to present and discuss the upcoming median project for Highway 74. The attached infographic contains links to maps and oher pertinent information. • How do I request yard debris pickup? • What if I have a water leak? • Who do I call in an after-hours emergency? Find answers to these and other questions on our FAQ's page.